I saw the Friday’s Fave Five over on the Dusty Cellar and I really liked the idea. So I am adding yet another carnival to my list! I don’t have 5 favorite things from the week so I decided to do my 5 favorite pictures from vacation. I have spent the week editing and have looked at these pictures for a long time. Here they are! 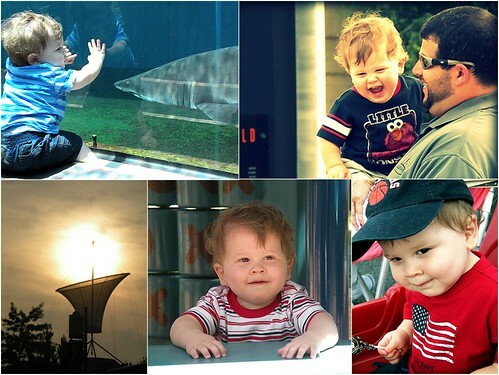 1 – Ethan loved the Sharks at the Aquarium. I thought for sure he would be scared to see this guy so close. But he loved it! He was banging on the glass (I know, never tap on the glass, right?) and laughing at it! I am so glad I was able to get this shot. 2 – This moment was caught while we were taking Ethan around downtown Pittsburgh. Hubster plays a game with him while they are walking down stairs. As they go down each stair, hubster makes makes funny sound (I wish I could describe it better) and it just makes Ethan laugh and laugh and laugh. This is my number one favorite picture right now. 3 – This shot was actually the hubster’s idea. As we were walking around downtown, the sun was going down. That satellite looking thingy is actually the top of the Carneige Science Center. He thought it would make a cool picture and he was definitely right. 4 – Since we stayed in Pittsburgh for a week, we had a lot of time to visit with family. On this day, we took Ethan to the park with his Pap-Pap (his great-grandfather). He had a blast running around and swinging on the swings. As part of the jungle gym, they had this little area that looked like a store. We were playing ice cream truck and Ethan was handing out all the treats. 5 – For the 4th of July, we went to a parade. Ethan loved looking at all the trucks and playing in his wagon. But the one thing he loved more was that Tootsie Pop. He would not put it down. So there you have it…my 5 favorite pictures from vacation! I love that shot of the aquarium. It's really great. And yes, the walk was in Ambler PA. So I guess you are in my area too. Cool! Ethan is ADORABLE! I just wanna reach in to the screen and pinch those cheeks! I love your new carnival, by the way, I look forward to seeing more. Hope you have a fun SITS day! What a precious little boy you have! Keep taking those pics of him – you will never regret it. And your little guy is just too cute!! I love the look on Ethan's face when daddy carried him down the steps. Priceless! What a cutie patootie you have! What a cute little boy! Those are all great pictures. What a fun vacation! Ethan definitely looks like he had a great time! visiting over from SITS. What a great post idea and beautiful pictures. Have a wonderful day. What's the third one? Is that a boat? Here from SITS. What a fun post and what beautiful photos! I like this blog, Ive had a little trawl around. I especially enjoyed the post 101 in 1001! Good goals!! Welcome to Friday's Fave Five! What a lovely collage of pictures. Your little guy is so adorable! Welcome to Fave Five! I've been here for a few weeks and love it. Ethan is just adorable and it looks like you had a great time on your vacation. Hey I'm from PITTSBURGH! Those sharks are JAW-SOME! I love your pictures, you son is adorable!